Zachary John Quinto is an American actor primarily known for playing Sylar on Heroes and Spock in the 2009 film Star Trek. 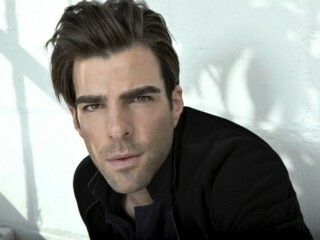 Zachary Quinto was born on June 2, 1977 in the Pittsburgh, PA borough of Green Tree. Unfortunately, his father John, a Pittsburgh hairdresser, died of cancer when Zachary was only 7. He thankfully he was able to funnel any grief into his newfound love for theater from early on, first as a young theatergoer, and soon after as an actor-in-training. By the age of 11, he was appearing in productions with the regional music theater company, Pittsburgh City Light Opera. While still in high school he received his first artistic honor - a Gene Kelly Award for his role in "Pirates of Penzance." Quinto quickly made the decision to pursue acting as a career, so after graduating from Central Catholic High School in 1995, enrolled in Carnegie Mellon University's music theater program. He graduated in 1999. Never one to forget his roots, this born stage actor would remain active in theater during his rise on television, appearing in plays in New York and L.A., including three seasons with the Ojai Playwright's Conference. Quinto moved west in 2000, beginning the long journey toward making a name for himself in Hollywood. The trim, 6'4" actor with sparkling eyes fared well at auditions, appearing as a wide variety of characters on shows like "CSI" (CBS, 2000- ), where he was an implausibly attractive chop shop mechanic; "Six Feet Under" (HBO 2001-05) where he played an art school classmate of Claire's; and "Joan of Arcadia" (CBS, 2003-05), where he guested as God. In 2004, Quinto landed his first recurring role as techie Adam Kaufman on the award-winning action series, "24" (FX, 2001- ). It was a peripheral character who only appeared during the show's third season, but the experience of working as part of a cast in a highly-produced weekly drama would be invaluable for Quinto, whose big break was less than a year away. After a few minor roles on the short-lived sitcom "Twins" (The WB, 2005-06) and gritty drama "Blind Justice" (ABC, 2005-06), Quinto was back in regular rotation on "So NoTORIous," playing Tori Spelling's flamboyant Persian-American sidekick on the VH1 sitcom. With Quinto's contribution, the well-reviewed show was nominated for a 2007 GLAAD (Gay and Lesbian Alliance Against Defamation) Media Award. However, the program suffered in the ratings, being cancelled after its first short season. That same year, versatile Quinto blew away producers at an audition for "Heroes," earning a recurring role as the show's complicated villain Gabriel "Sylar" Gray. In the sci-fi drama, which followed an ensemble cast of characters with incredible abilities who save the earth and all of mankind, Quinto's brain-eating serial killer Sylar was initially shown only as a shadowy figure in a baseball cap and trench coat - a part played by a stuntman. In the show's eleventh episode, the mysterious figure was fully revealed, and the up-and-coming actor quickly became the most popular "quiet psycho" in prime time - most particularly for his deft ability to alternate between raging killer and pensive introvert. Sylar proved to be central to the themes of the show, and Quinto was officially added to the show's cast when it was renewed for the following season. Even bigger news than making castmember on one of the hottest shows on the air - being selected to portray one of the most iconic characters in the history of television - pop culture, even: that of a younger version of Mr. Spock, in J.J. Abrams much-anticipated big screen reinvention of the "Star Trek" film franchise. Not only was the casting of Quinto met with almost universal acceptance by even the most critical of fanboys, more importantly, Leonard Nimoy gave the casting his own personal stamp of approval. For Quinto - who grew up without a father around - he seemed not only to have landed a career-making role beyond even the "Heroes" universe, but a kind of father figure in Nimoy, who took the young actor under his wing. As expected, the film was a smash summer hit, upon its release in May 2009. Much of the critical kudos were directed in Quinto's direction, due in part to his riveting performance of the stoic, yet emotionally vulnerable Vulcan. Quinto's theatre experience includes roles in a variety of productions, including Much Ado About Nothing at the Los Angeles Shakespeare Festival and Intelligent Design of Jenny Chow at the Old Globe Theatre. Baseline Studio Systems announced in January 2010 that Steven Spielberg may direct a biopic about George Gershwin, which is scheduled for release in 2012, with Quinto confirmed for the lead role. From October, 2010 to February 2011, Quinto played the lead role of Louis Ironson in an Off-Broadway revival of Tony Kushner's Angels in America at the Signature Theatre, New York, NY. For this role, Quinto received the Theatreworld Outstanding Debut Performance award. He has modeled for magazines including GQ and August. In 2010, Quinto´s company BtD produced Margin Call, an independent film about the financial crisis. Quinto played the role of Peter Sullivan in the film, in a cast that included Jeremy Irons, Kevin Spacey, Stanley Tucci and Demi Moore. Margin Call premiered in January 2011 in Sundance film Festival. Quinto publicly came out as gay person in October 2011.